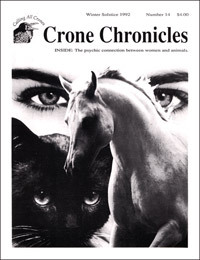 Crone Chronicles #14(original) Women & Animals [cc14] - $5.95 : BBI Media - Magazines that feed your soul. "Here in my tiny yurt in Kelly, Wyoming (pop. 200), I warm myself in front of the fire. Outside, it is twenty below. Coyotes howl, their wild calls piece the frozen night air. The dancing stars illuminate the Tetons. I sit here, warm and blessed, grateful for the capacity to appreciate life." Thus begins editor Ann Kreilkamp's editorial in this issue from the Winter of 1992. Ann brings together a half-dozen wonderful crone voices in this sweet, small issue, with the theme of the psychic connection between women and animals. The heart of the issue (and a "must-read" for horse lovers of all ages) is her interview of Cheryl Hymas, who discusses her evolution from activist to horse breeder, and how she came to understand the intelligence, empathy, and even psychic gifts of the horses who she now considers members of her family. There's also Lyn Dalebout's tale of meeting with the animal spirits of Chaco Canyon, and Lyn Ferguson's story of finding her inner child with the help of an encounter with a mother bird and her nest. Plus journal entries after a hysterectomy, an arresting visit from the Crone archetype to a younger crone (age 54), and much more. 40 pages, published Winter Solstice of 1992.